Clare is a county on the heart of the west coast of Ireland located along the Wild Atlantic Way coastal route. With a varied terrain ranging from rolling countryside to the Atlantic coastline. 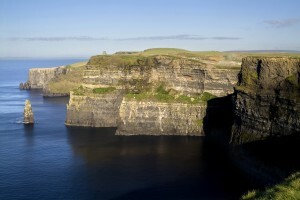 County Clare is an excellent place to discover culture in Ireland. The county is blessed with places to visit – from the UNESCO Burren, Cliffs of Moher Geopark, award-winning Loop Head and some historic towns like Bunratty, Killaloe and Ennis. The Cliffs of Moher is one of Ireland’s most visited attractions and when you will visit you will see why! The cliffs rise to a height of 120 metres above the Atlantic Ocean and even reach 214 metres at the highest point near O Brien’s Tower, an observation tower built by local landlord Cornellius O’ Brien. 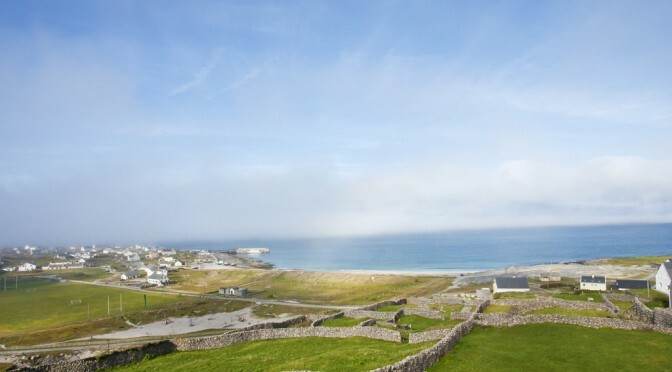 The views are stunning and on a clear day you can see the Aran Islands, Galway Bay and even as far as Connemara! On the opposite side of County Clare in the East, you will find Lough Derg. There are two Lough Derg’s in Ireland, the other one is in Donegal. Lough Derg in Clare is the second-biggest lake in the Republic of Ireland and the third-biggest on the island of Ireland. It shares is shores with northwest Galway and eastern Tipperary. 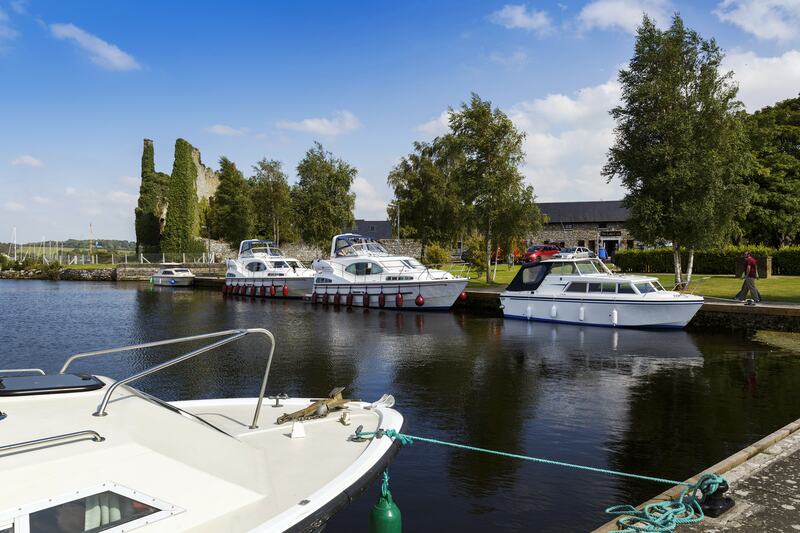 On the Clare side, some nice places to visit along the lakeshore include Killaloe, a picturesque town with nice bars and restaurants and a 13th-century cathedral, Scariff and Mountshannon where you can take a boat trip across to Holy Island in the centre of the lough. 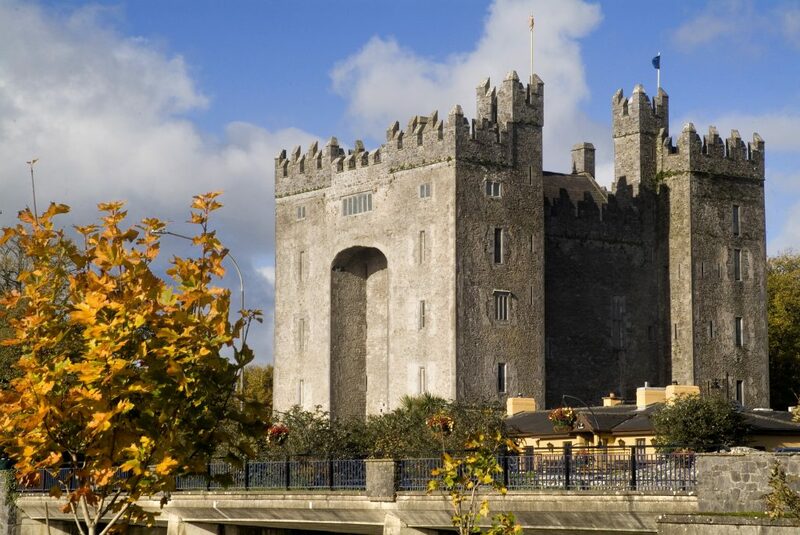 Bunratty Castle is the most complete Castle in Ireland, it is completely furnished on the inside giving the visitor a real sense of what the castle would have looked like for residents in the 15th century. Bunratty Folk Park which surrounds the castle is a reconstructed village where buildings like the rural farmhouse, the village shop and post office and several different types of traditional cottages have been recreated. The folk park gives a fantastic insight into what life was like for different segments of Irish society in the early 19th century. If you are staying in Clare region, think about visiting Bunratty at night to take part in one of their famous medieval banquets. Advance booking is required for this and we can book this for you as part of any tour visiting Clare. This attraction is especially good if you have children with plenty of parkland to run around in and a collection of unusual animals such as wild boar! 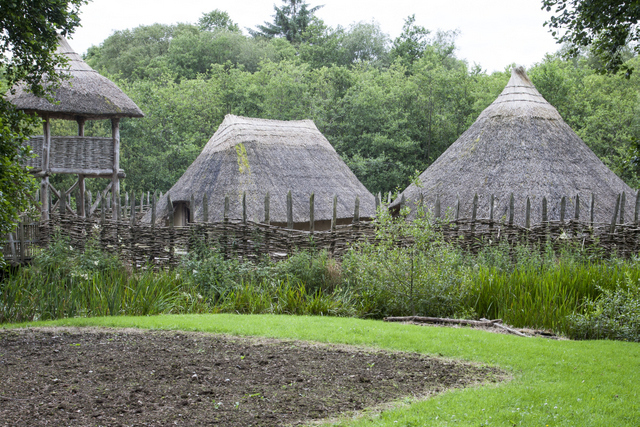 On-site the primary feature is a reconstructed Crannog; an artificial island on which people built houses, kept animals, and lived in relative security from rival clans, a ring fort. The attraction also has a souterrain which is an underground tunnel used for storage or to hide from would-be attackers, a fulacht fia which was used for cooking in the Bronze Age and Craggaunowen Castle, a typical example of a fortified tower house built in 1954. The Burren refers to the regions of Clare and south Galway which share a unique karst landscape known for its rare species of flora and fauna. The main towns in the Burren region are Ballyvaughan, Kinvara, Tubber, Corfin, Kilfenora and Lisdoonvarna. 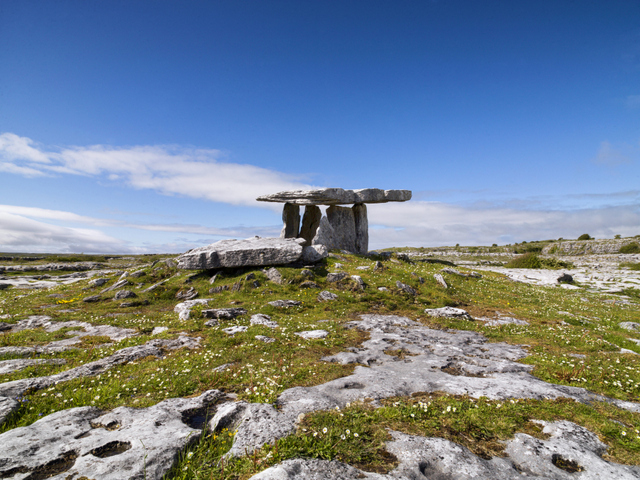 The Burren National park is located in Corofin, here you will find five marked walking trails that take you through many different fascinating and beautiful habitats, such as limestone grasslands, hazel/ash woodlands and limestone pavements. If you plan to visit the national park, a good place to start is the Clare Heritage Centre in Corofin. In the village of Balllyvaughan consider visiting Ailwee Caves, a cave system consisting of over a kilometre of passages leading into the heart of a mountain. 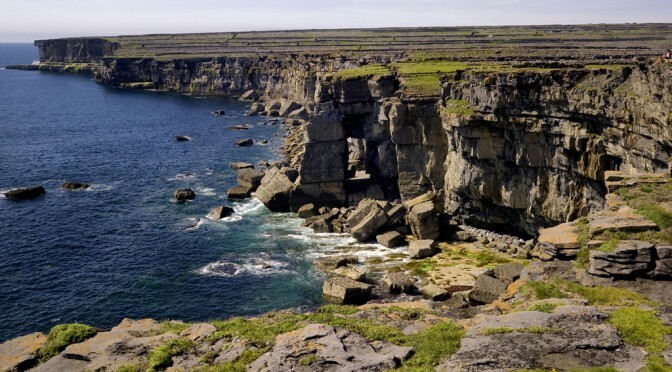 The Loop Head Peninsula at the very tip of southwest Clare is a scenic coastal drive which takes in the coastal villages of Kilrush, Carrigaholt, Kilbaha, Loop Head, Kilkee and Kilrush – the entire journey is a distance of around 81 km. 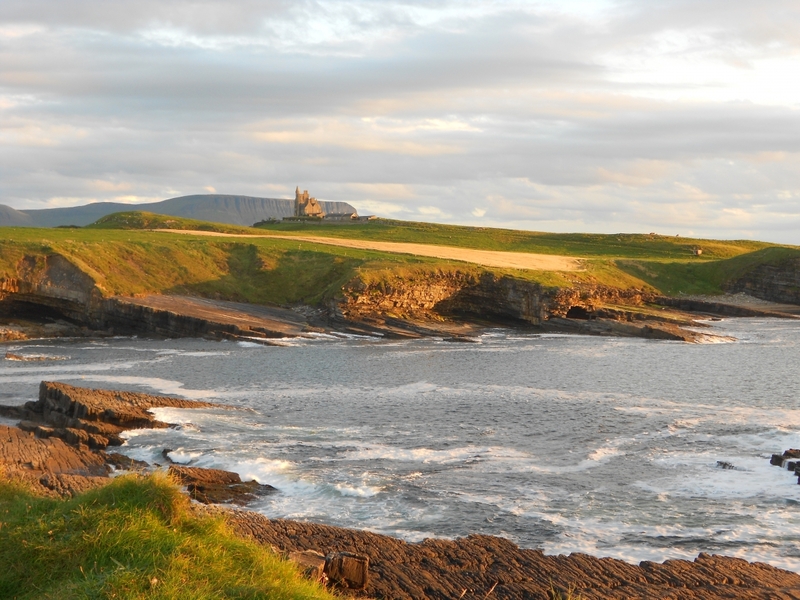 Top sights to take in include Loop Head’s main town Kilkee which was frequented by the likes of Charlotte Bronte and Alfred Tennyson and Carrigaholt which has outstanding sea views. One of the most beautiful natural features on the peninsula are the Bridges of Ross on the western side of Ross Bay harbour, looking north to the Atlantic Ocean. 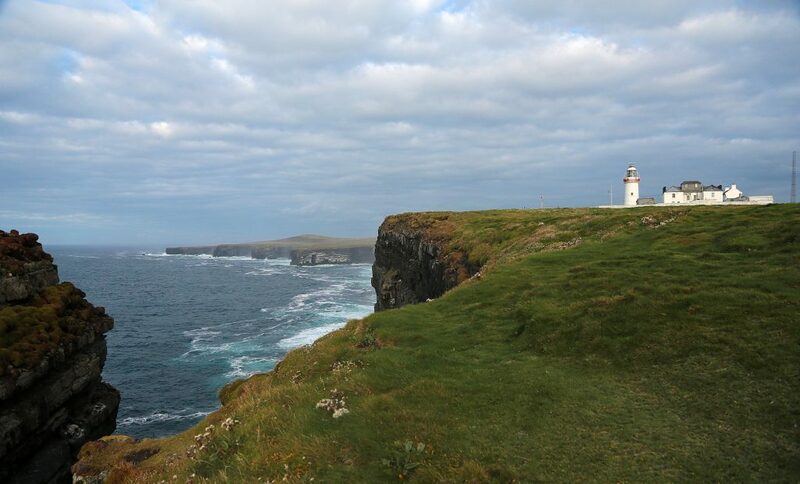 At the very tip of the peninsula, you will find Loop Head and its famous lighthouse. 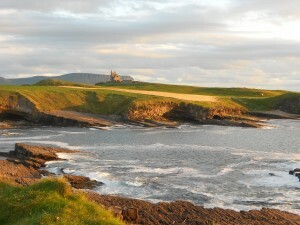 Clare is a very popular surfing destination and it is known throughout the world as a surf destination. 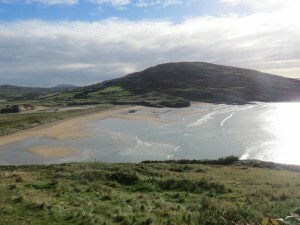 Fanore, in particular, is famous for surfing and water sports. Fanore is a small little village and it has accommodation options along the beach to stay and enjoy the waves and ocean. It does not matter your surf ability – with surf schools available it caters for everyone and don’t be afraid to try and catch a wave on The Wild Atlantic Way! County Clare is blessed with its unique landscape in the Burren area and it has some of the most famous caves in the country. 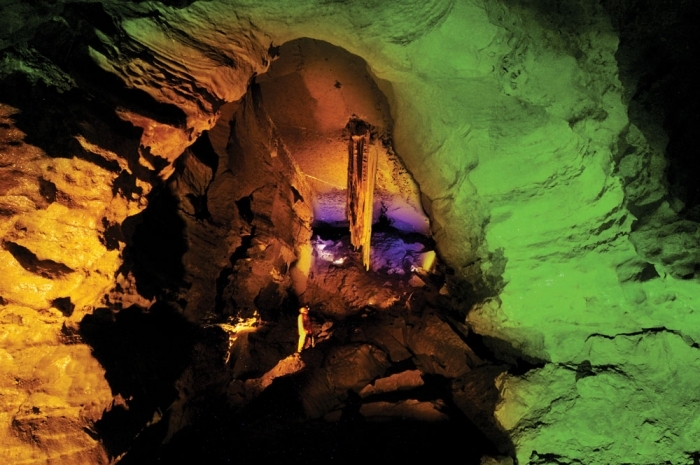 Take a tour at the Aillwee Cave and explore the winding passages, chasm, rock formations and waterfalls. Doolin Cave is famous for its Great Stalactite and you will get the chance to go underground by 200 feet and be transported back 350 million years. 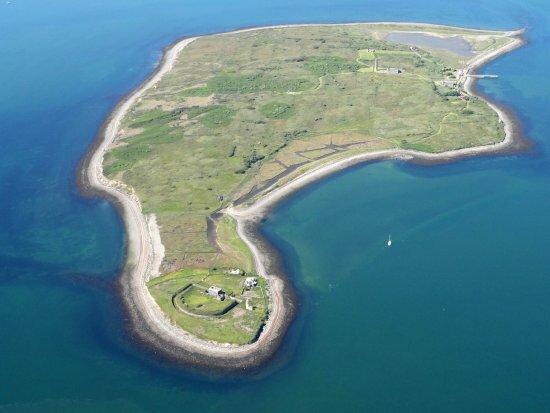 Scattery Island can be reached by boat from Kilrush pier during the summer season with guided tours available free of charge. It is a monastic island and named after the mythical monster on the island. It was St Senan who founded the monastic settlement on the island in the 6th century. Over the years the islands have been attacked by the Vikings and others but in spite of this the round tower, cathedral and oratory can still be seen. The last island dwellers left in 1978 for the mainland; who were river pilots and gifted currach handlers. The ruins of the village remain with streets and several churches remaining. On the island also is a Holy Well which has healing properties. 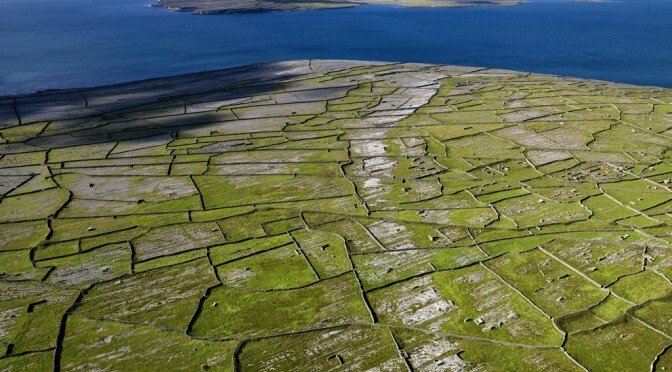 What are The Aran Islands and why are they interesting? The Aran Islands; Inishmore (Irish Spelling Inis Mór), Inisheer (Inis Oírr) and Inishmaan (Inis Meáin) are located off the coast of Galway. The islands lie about 13km (8 miles) from the coast of Galway. This distance to the mainland has made the islands far more traditional than the rest of Ireland. 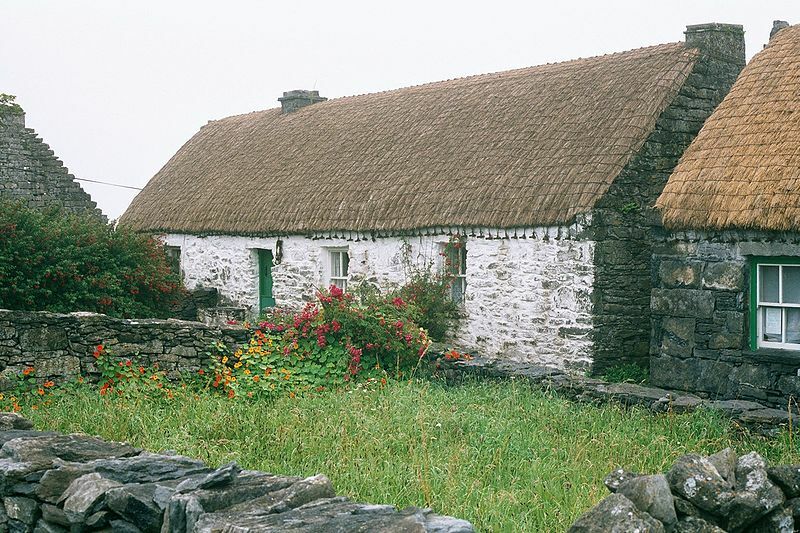 Many traditional farming and crafts can still be seen on the island and the people speak Irish as their first language here. 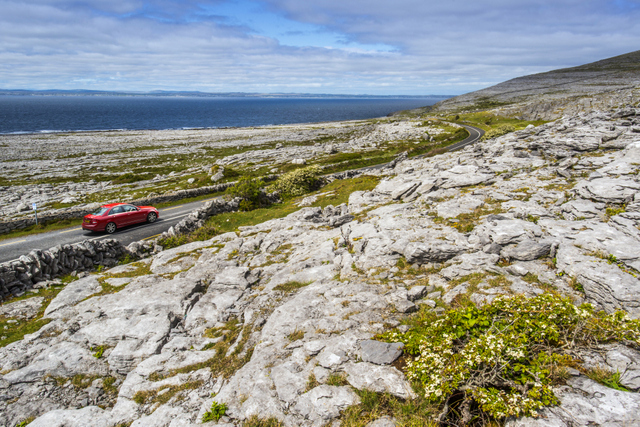 The landscape on the Aran Islands may be like nothing you have seen before. It is karst and rocky and you will find land made fields surrounded by stone walls. Clothes – The Aran Islands are famous of course for the traditional Aran Sweater but some other clothes are also unique to the island; the men for example wore a woven belt called a Crios and leather shoes called Pampooties! You can find out more about traditional Aran dress in the Stitches in Time exhibition at the Aras Eanna centre on Inisheer. 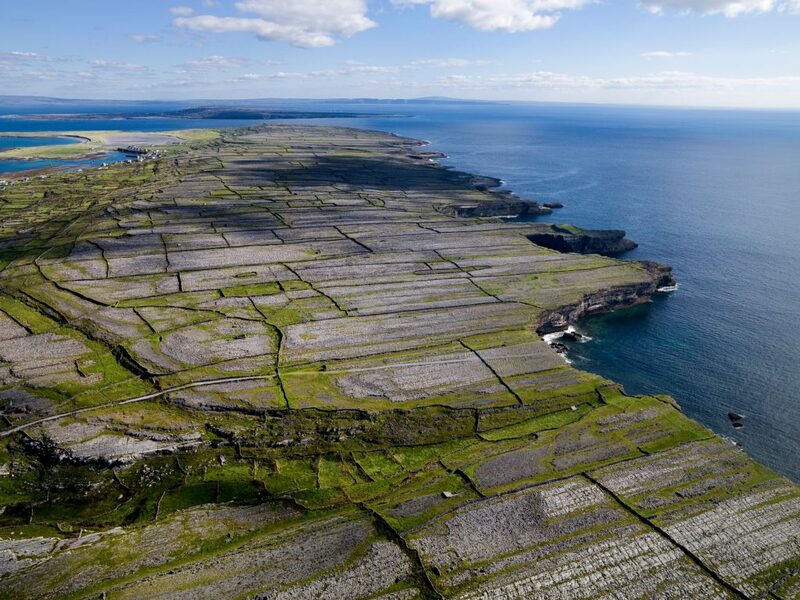 Land Making – The land on the Aran Islands is karst and rocky so the locals have to create land, they do this by mixing sand and seaweed and placing on top of rocks to create fertile soil. Currach Boats – you may see these lying on the beaches on Aran Islands, they are a traditional Irish boat with a wooden frame over which animal skin would have been stretched over, although modern Currachs are now covered with canvas. These Currachs were a lifeline for Aran natives in times before motor powered boats and ferry crossings. Day Trip or Stay Overnight? Many of our clients take day trips to the Aran Islands. We recommend getting the morning ferry or flight and taking the evening ferry home. Make sure you leave in plenty of time and arrive at your departure point about 30 minutes early. The ferries usually leave on time and the journey to ports can sometimes take longer than expected. Calculate the time it will take you to get from your location to the port and add an hour to it! There is ample accommodation on all of the islands, should you wish to stay overnight. There is a hotel on Inishmore as well as several good B&Bs, Inisheer has a small hotel/guesthouse and several good B&Bs and Inishmaan has several good quality B&Bs. Get in Touch with us about booking your Ireland package including the Aran Islands and we can secure you the best available accommodation. Although some of the ferries may have wheelchair access, access to the ferry is often by floating pontoon which may not be suitable for wheelchair users, depending on tides. The best thing to do is to check with the ferry company a few days in advance. The islands themselves are not totally disabled friendly, the tour companies on the ground do not have wheelchair adapted buses and the ground can be quite uneven in places and so is not ideal for maneuvering wheelchairs around. The best way to learn about the Aran Islands is to visit yourself. Contact us today to book your trip! Ireland is known as one of the most romantic places in the world. When you think of old-school romance Ireland is a place that pops to the front of your mind. There are places all over Ireland, full of excitement, magic, mystic and the adventures that romance brings. In this month’s blog, you will have the opportunity to learn about some of the 6 most romantic places in Ireland to visit. Whatever your length of holiday, Ireland provides charm and romance in all regions of Ireland. 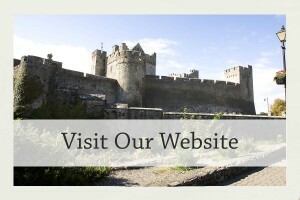 At Irish Tourism, we have excellent packages available for romantic Castle and Manors tours. With an influx of honeymooners every year to Ireland we can tailor a package to suit your needs and wants that you are looking for on a romantic Honeymoon break that can include a castle stay. This area on the island of Ireland is widely regarded as one of the most scenic and romantic places in Ireland to visit. Lonely Planet has named it in their 2018 ranking as one of the best regions in the world to visit. On this Causeway Coast, you get to experience the UNESCO World Heritage Site – Giants Causeway to the Carrick – a – Rede Rope Bridge offering breathtaking views of the coastline. Dunluce Castle is an iconic medieval ruin castle on the Causeway coast. Built in the 1550’s MacQuillan family. This caste is full of charm and comes with lots of history and stories. 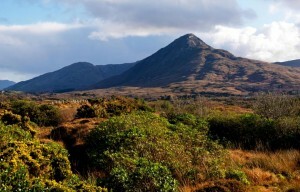 Connemara is situated just one hour west of Galway city, is one of the beautiful and romantic places in Ireland to visit. As you drive back into the heart of the Connemara region you can’t help but not be engulfed in the romance of the area with its rugged landscape and is easy to see why it is one of the most romantic places in Ireland. To signify its romance stature it was the film location of The Quiet Man, a romantic comedy. 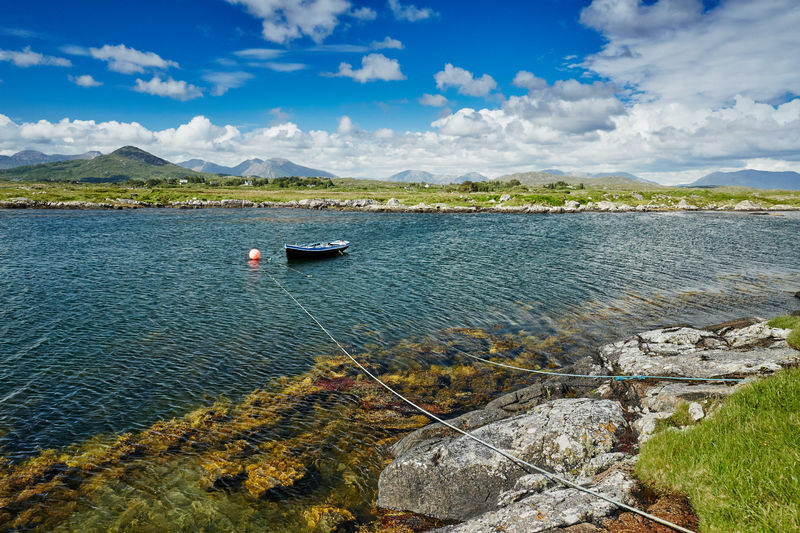 Connemara has everything you need to enjoy some special time with a loved one from a cosy thatched pub, pretty secluded beaches, mountain, forest walks and adventure. 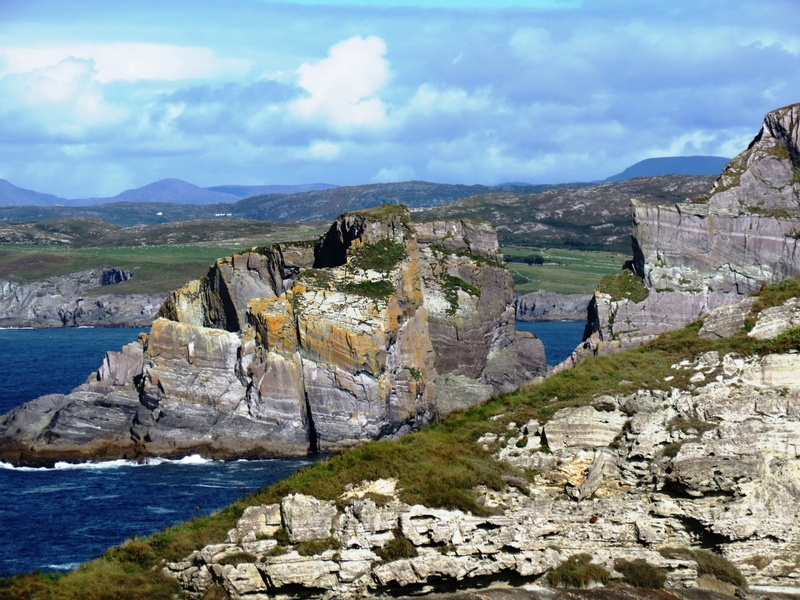 Kerry located on the Southwest Coast of Ireland and it is famous for its 180km Ring of Kerry drive with is a stunning array of photo opportunities throughout the drive. Panoramic pictures of bays, inlets, lakes and the highest mountain range in Ireland in the Macgillyicuddy Reeks with the highest mountain being Carrauntoohil. The most recent famous attraction off the Ring of Kerry road on the southern part is the Skellig Ring where you can see Skellig Michael where the recent Start War films have been filmed on the UNESCO World Heritage Site. Detour off from the town of Caherciveen and return to the Ring of Kerry road from Ballinskellig area and continue towards the village of Waterville made famous as the holiday vacation place of Charlie Chaplin. 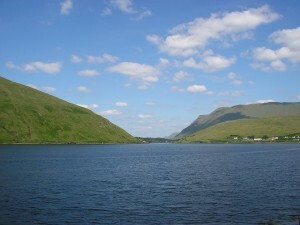 Kerry is widely regarded as one of the most romantic places in Kerry to visit. 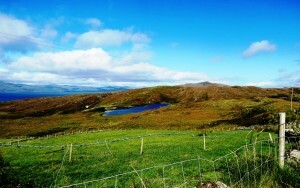 If you are looking to experience romance in Ireland, Donegal is an excellent choice to pick. National Geographic has recognised this and in 2017 put it on the top of the Cool List for 2017. Lough Eske is a small lake located northeast of Donegal town. You have the beautiful Lough Eske Castle if you want to treat yourself and your partner to a nice romantic setting. Also, there is Harveys Point Hotel nestled in the heart of the Blue Stack Mountains and also on the waters of Lough Eske, rated as the Top 4* Hotel in Ireland by TripAdvisor. It is the perfect place to visit when in Ireland on a romantic break. Powerscourt is surrounded by the Wicklow Mountains and is a truly magical place to experience and explore. 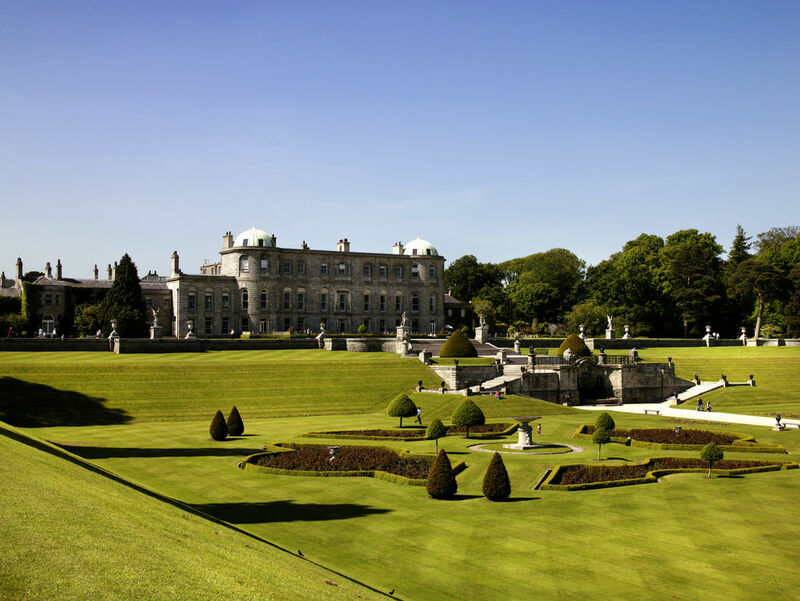 Powerscourt Estate less than one hour south of Dublin City; the estate is full of romance and grandeur with splendid gardens filled with spectacular flowerbeds, lakes, walking path for romantic strolls and endless green spaces. A short drive away is Ireland’s highest waterfall which is the perfect place for a romantic walk, take photos and also a beautiful place for a picnic with a loved one. 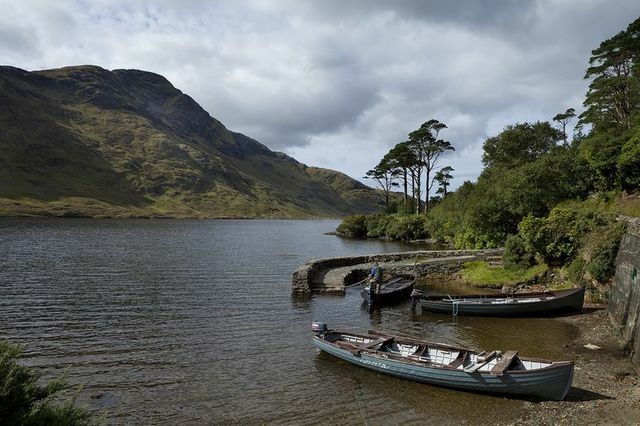 Gougane Barra National Park is set in 1,000 acres in the unspoilt landscape it is an ideal location for romance in Ireland. 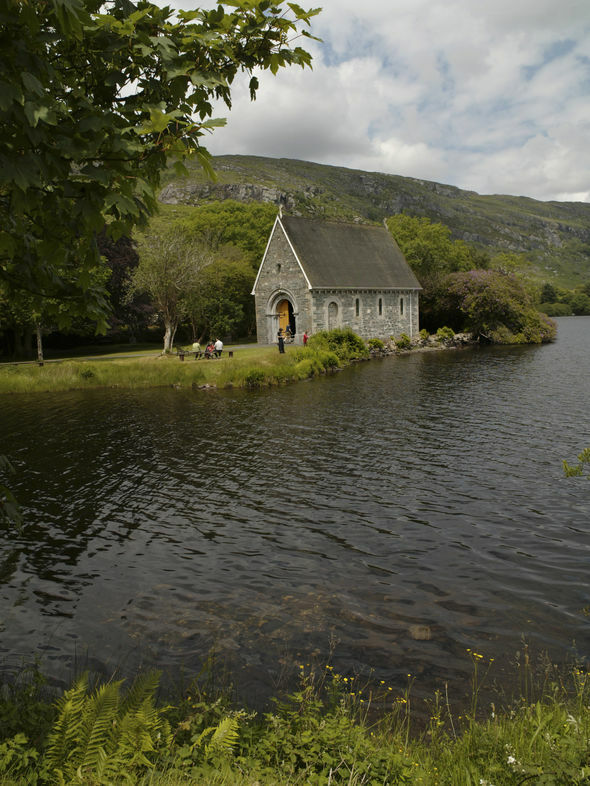 Gougane Barra National Park is located just over an hour west of Cork City. This is a special place and it is not so crowded so you are guaranteed some quiet romantic time. It has some beautiful walks that take you down by the picturesque lake. You will find a small church that was once a Christian monastery founded by St Finbar, the patron saint of Cork. If you want some extra adventure you can enjoy cycling, fishing or boat trips that are very romantic. The best way to learn about Ireland, its charm and romance that it offers from the place is to visit and experience them yourself and your loved one. Contact us today for a free quotation from our dedicated travel advisors who will be able to help you create your ideal romantic trip to Ireland and answer any questions you may have. We can tailor your itinerary on any of our Self Drive or Chauffeured tours. In this month’s blog, you have the opportunity to learn about some of the 15 Best Towns To Visit In Ireland. Ireland as a country is dotted with endless beautiful towns and villages. Ireland’s towns and villages are full of character, charm, culture and heritage that defines them as unique in their own right. Some of these towns sweep along the raw beauty of the Wild Atlantic Way to the hidden gems in Ireland’s Hidden Heart Land and Ireland’s Ancient East. The selected Best Towns To Visit in Ireland below has their own beauty that is full of creativity and uniqueness for you to experience. Doolin is a small village in Clare located on the west coast about five kilometres from the towering Cliffs of Moher which lie southwest of the village. Doolin is an extremely popular place with travellers with its Irish bars which are famous for playing traditional Irish “Ceili” music nightly. 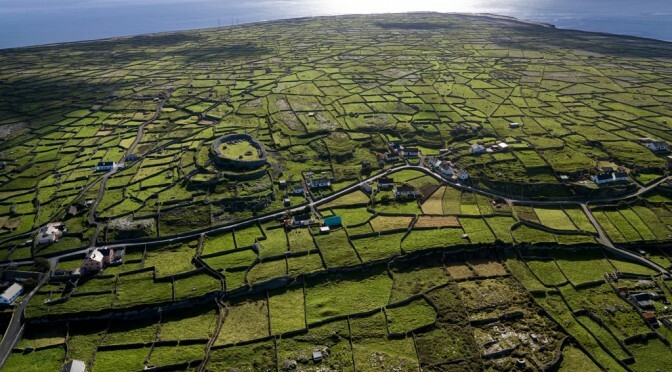 It is also a village where you can access the famous Aran Islands from which are not too far offshore. 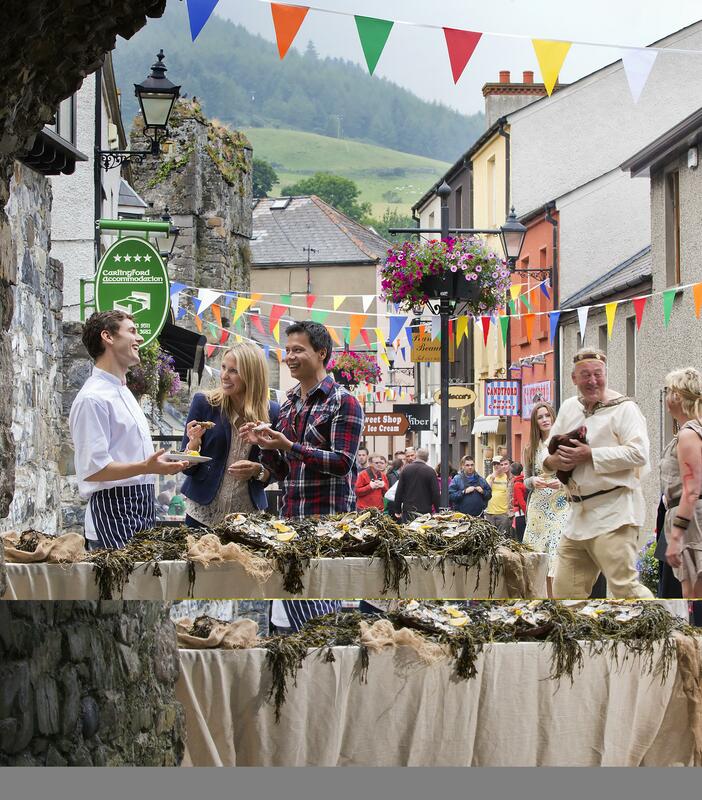 Doolin is in the heart of the Burren and its home to an excellent gourmet trail of different food businesses. Doolin is one of the best towns to visit in Ireland especially in the summer months where it is thriving as a tourist destination with excellent accommodation options along with craft shops and activities. Enniskerry is located in the heart of the Wicklow Mountains and only a short drive from Dublin. It is a fantastic base to explore Glendalough, Powerscourt Gardens, Sally Gap and Lough Tay (Guinness Lake). Enniskerry itself has some terrific cafes and tea rooms. The clock tower at the centre of the village frames the town, it is a great place to relax and unwind in a beautiful day and people watch. There is an excellent array of restaurants offering great choice and you can have the chance to try someplace new every evening. Kinsale can be known as Ireland’s Gourmet Capital. You will find exceptional seafood restaurants with fresh fish caught nearby. Great array of international food and if traditional Irish food is something you look for, Kinsale has excellent Irish food in abundance. 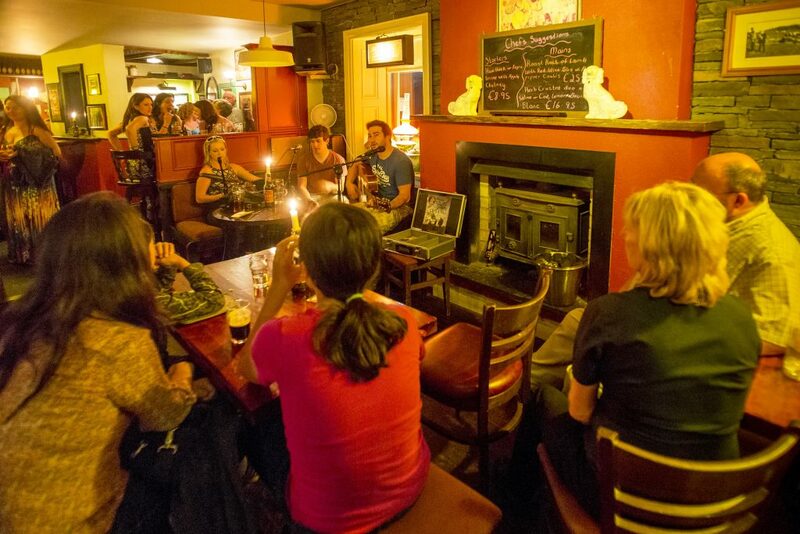 You will find excellent bars with traditional Irish music throughout the summer months. 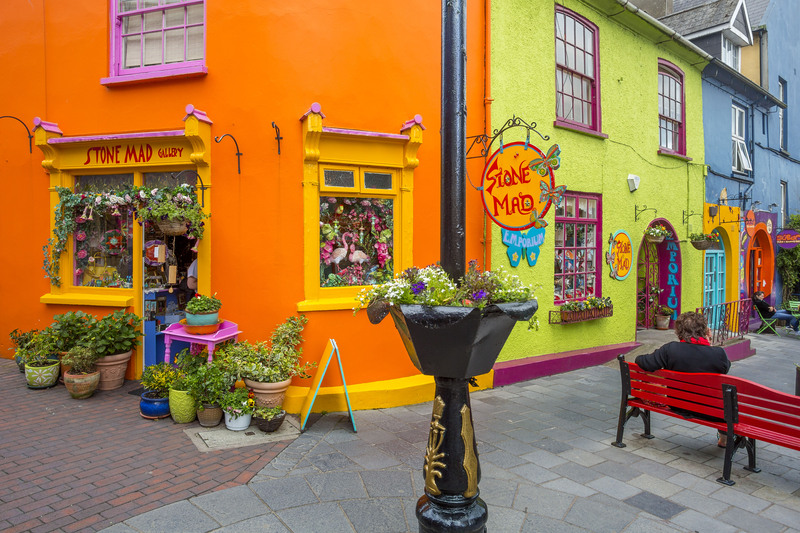 Kinsale is also famous for its arts and crafts and will find a diverse collection to choose from. While there it is worth a drive out to the Old Head of Kinsale which offers spectacular views of the surrounding area. Ardmore is situated on one of Ireland’s oldest Christian site and is ideally situated on the coastline of Ireland’s Ancient East trail. The village is extremely picturesque and has won many Tidy Town awards. Ardmore boasts a wide range of accommodation options with excellent food in the restaurants and fun pubs to visit. 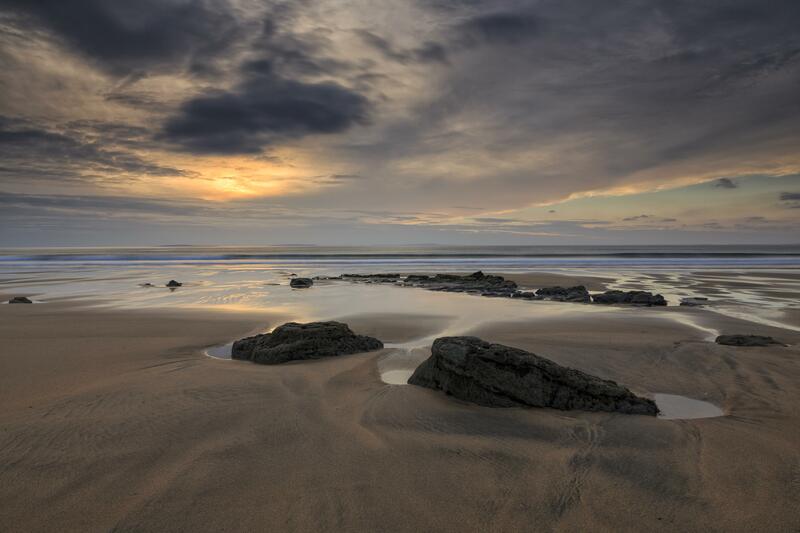 Ardmore boasts five beautiful beaches to choose from. 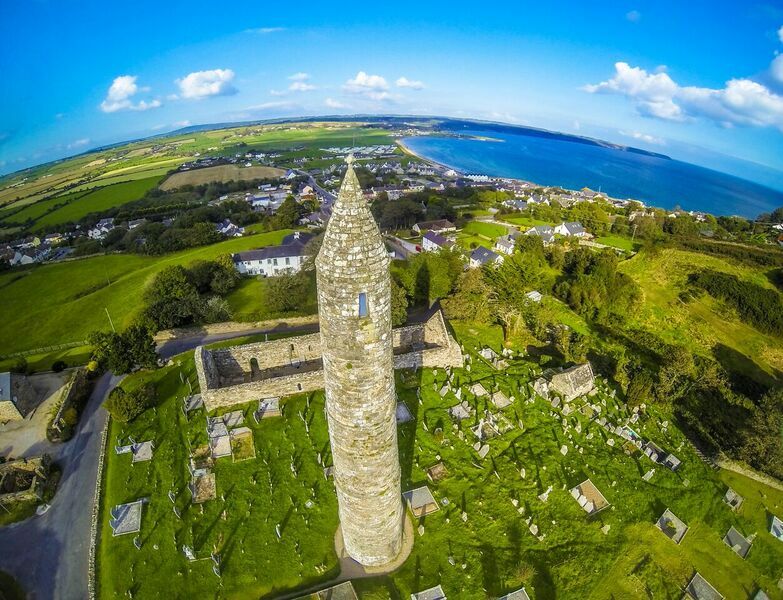 The town also has a lovely cliff walk to enjoy panoramic views of Ardmore Bay and boast one of the finest Round Towers in Ireland built on the 12th century. For water enthusiasts, a great way to see the coastline is by sea kayaking. If long walking is of interest it has the St Declan’s Way ancient pilgrimage walk from Ardmore to the Rock of Cashel in Tipperary and the total distance is just over 90km. Dingle is based in the western peninsula of Kerry. Dingle is famous for old-style Irish bars and is a mecca for seafood. It has also a thriving arts scene there with the Other Voices music festival being held there every December. Dingle has managed to retain its charm over the years in spite of its popularity. In recent years it has become famous for being a film destination with Star Wars being filmed in the area. Worth renting a bike or driving back west of Dingle and head for Slea Head, you will not be disappointed in the breath-taking scenery. If you are an Ice – cream fan, Murphy’s homemade ice cream with a selection of different flavours is well worth stopping at. 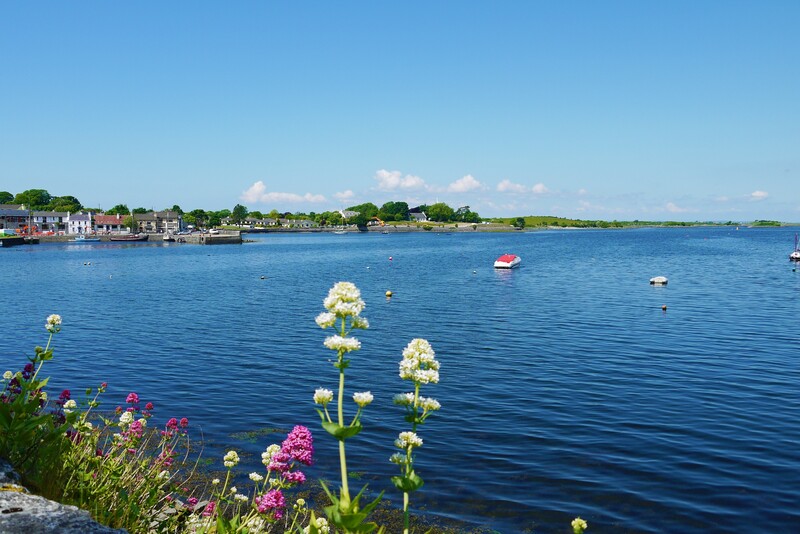 Kinvara is a scenic town on the southern shores of Galway Bay and gateway to the Burren. Kinvara is translated as “The Head of the Sea”, was once a thriving port village and lots of trade went through it for the necessities of life such as food and turf fuel in the 19th Century. Kinvara can be one of the best places that you can visit in Galway with its close proximity to Galway city, it is buzzing in the weekends with an excellent array of pubs and restaurants. Kinvara is also home to Dunguaire Castle and is one of the most popular places to visit in Galway. 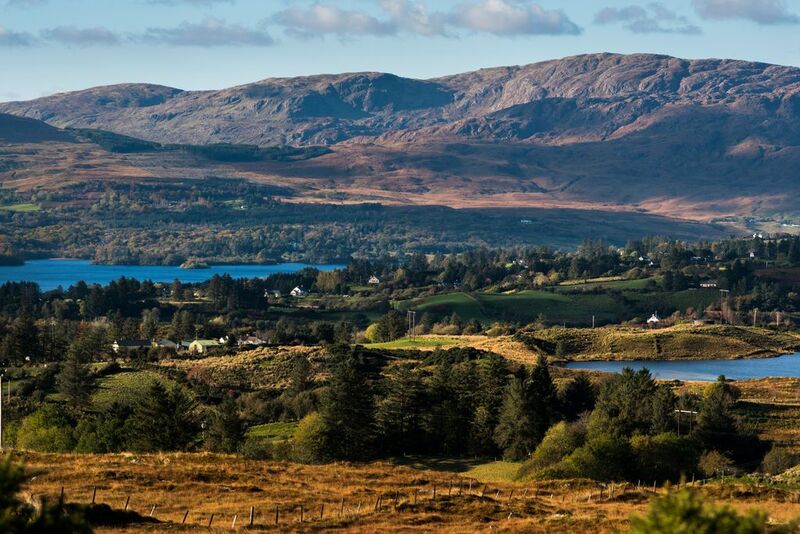 Kenmare is located on the picturesque famous Ring of Kerry. As a town it has got something for everyone from its excellent choice of restaurants, bars and cafés with superb accommodation options. Kenmare is beautiful in summer when the town park gardens are in full bloom with its stunning rhododendrons collection. 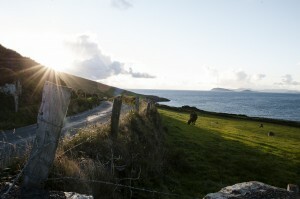 The town itself is beautifully situated as a great starting point for a drive along the Beara Peninsula. With golf courses, horse riding, trekking and unspoilt scenery, it is one of Europe most natural unspoilt places to visit. 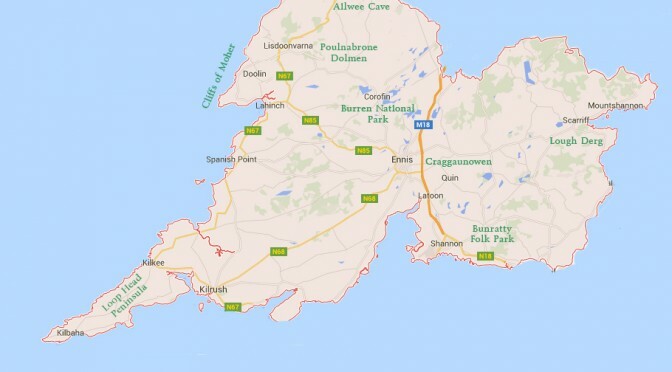 This town may be small and it is situated remotely in the tranquil setting of Donegal in the north-west of Ireland. 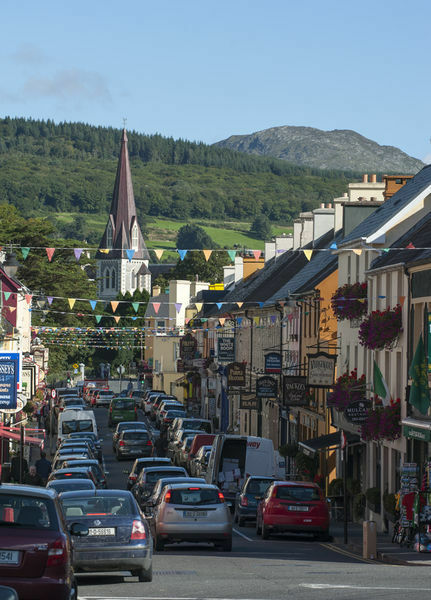 Gwedore is a Gaeltacht town with its first language spoken being Gaelic and is one of the largest places in Ireland that speak Gaelic and as a result of this, it is the heartbeat of Irish culture. Surrounded by rolling hills and mountains and long stretches of sandy beaches this is a very peaceful place and a great place to clear your head from daily life. An excellent site in Gwedore is Glenveagh National Park and Castle. Adare in Limerick is regarded as Ireland’s prettiest villages. The main street in Adare is dotted with an array of beautiful stone buildings, medieval monasteries ruins and beautiful village park which is a great place to take a peaceful walk. 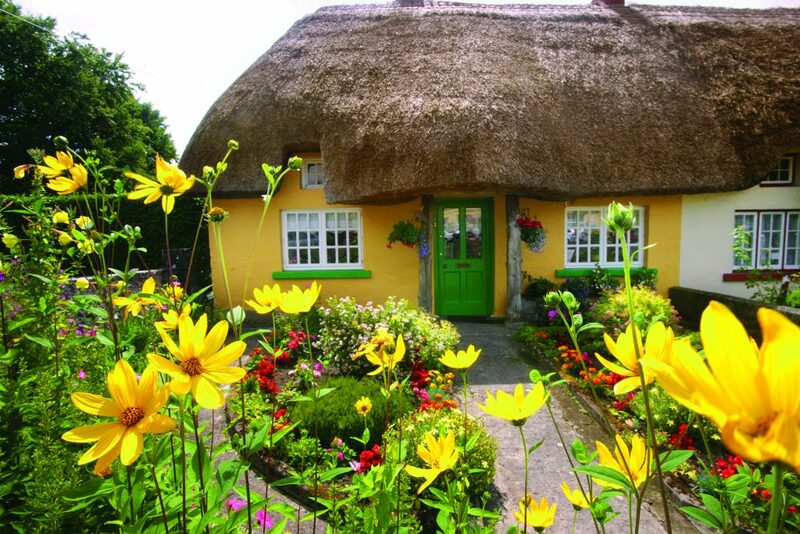 The pretty thatched cottages on the main street are part of the charm of Adare and why is it a great place to visit. 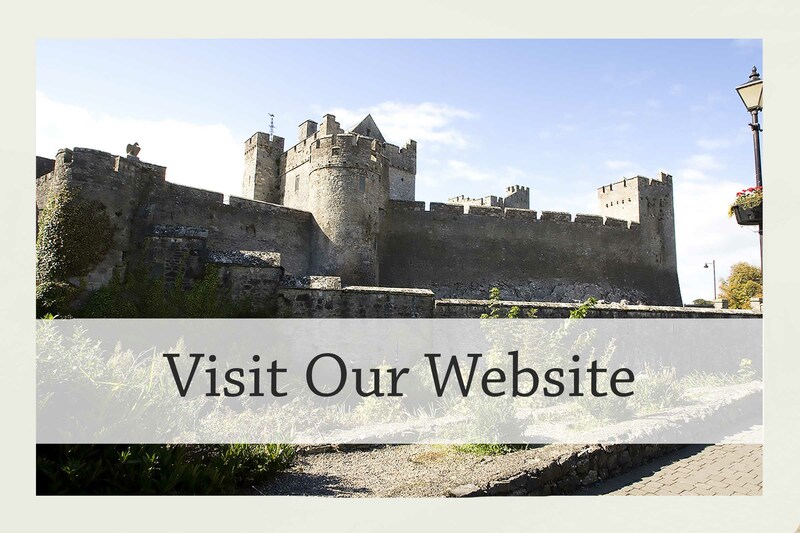 The town is full of historical landmarks such as Desmond Castle that dates back to the 12th century and Adare Manor which is today a luxury hotel and golf resort which re has opened in the last number of months after a two-year upgrade. With a great array of accommodation options, boutiques, craft shops and bars the village has lots to offer. 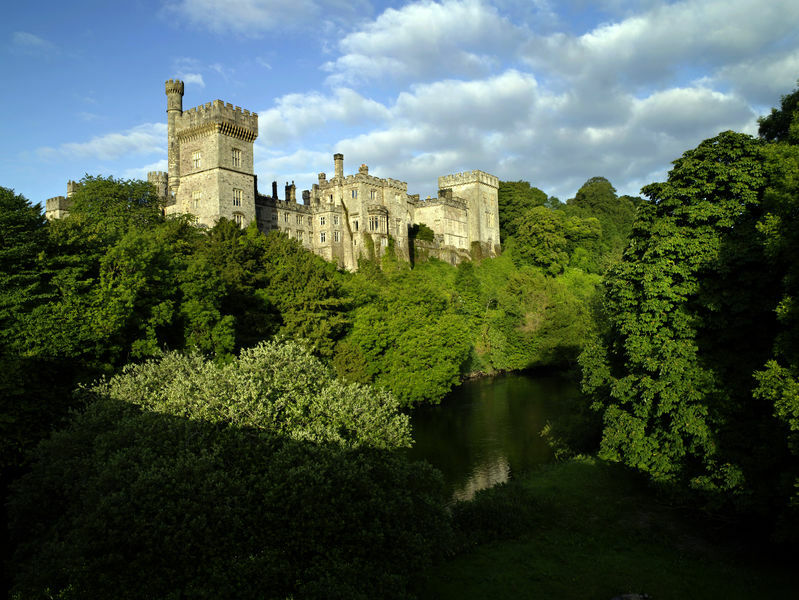 Lismore is located in the Sunny South East in the county of Waterford. Lismore is a stunning town situated in the lush countryside on the foot of the Knockmealdown Mountains and is one of Waterford’s most historical towns. You can spend time here exploring Lismore castle and the gardens the town’s main tourist attractions which are over 800 years old. The castle which was built in medieval times and build on a steep hill above the town, providing excellent views over the town. Time can also be spent exploring the woodlands around the River Blackwater. Dalkey located on the south side of Dublin city and it is home to the likes of Bono, Van Morrison, Enya and many others in the music and arts industry. In the past Vikings had a port in Dalkey which was first constructed in the 8th century. Dalkey and its neighbouring Killiney are considered one of the most affluent neighbourhood in Ireland to reside in. 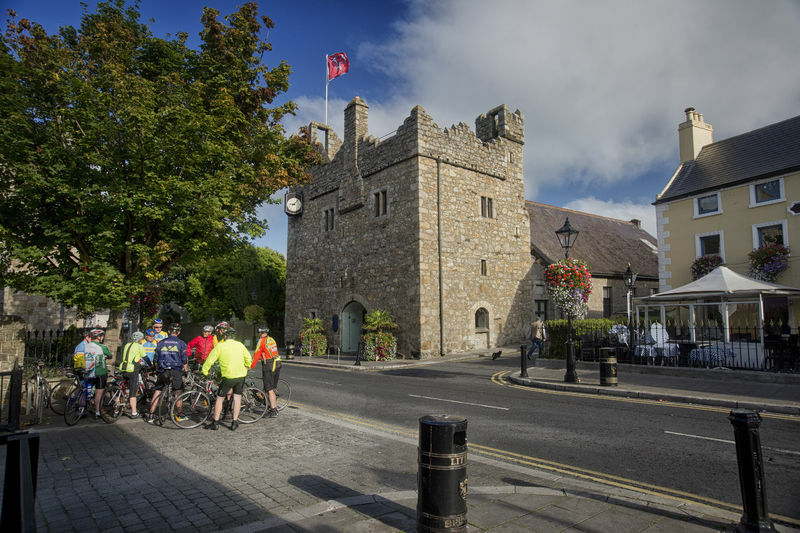 Today Dalkey is full of castles from its past and with a pleasant array of restaurants and bars to choose from. Close by is Killiney Hill which is an excellent place to go visit and get breathtaking views out over Dublin Bay. A peaceful village enclave not too far from the hustle and bustle of Dublin City Centre. This coastal town along the east coast of Ireland is on Ireland’s Ancient East no more than one hour north of Dublin. The town gets its name from the Old Norse which can be translated to “narrow sea inlet of the hag”. This town is surrounding by rolling hills and has roots to the Viking past with the towns’ street showing evidence of the medieval age. Carlingford offers adventure or a complete quiet retreat away from the hustle and bustle of city life. It has great live music in the bars and activities groups of friends or family. Also, it is known for its quality of fishing that can be fished from the place with oysters and crabs are often caught off the nearby harbour. 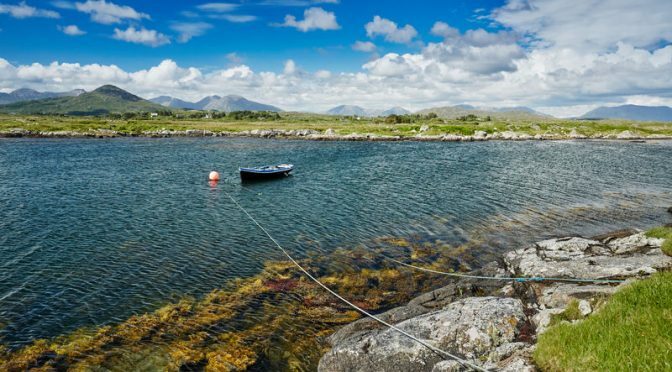 Clifden is located in Connemara and is one of the best towns to visit in Ireland if you are heading back west of Galway city exploring the national park. 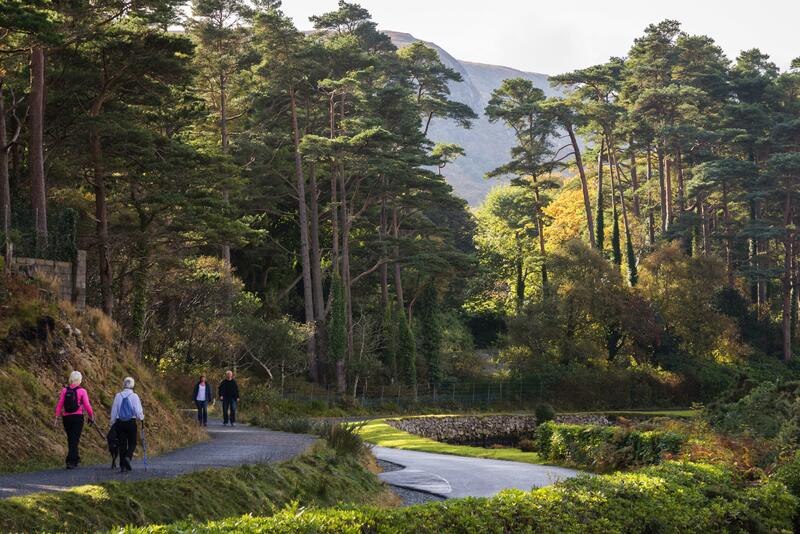 Not too far from Clifden is Kylemore Abbey and Gardens, one of Ireland’s most visited tourist attractions. 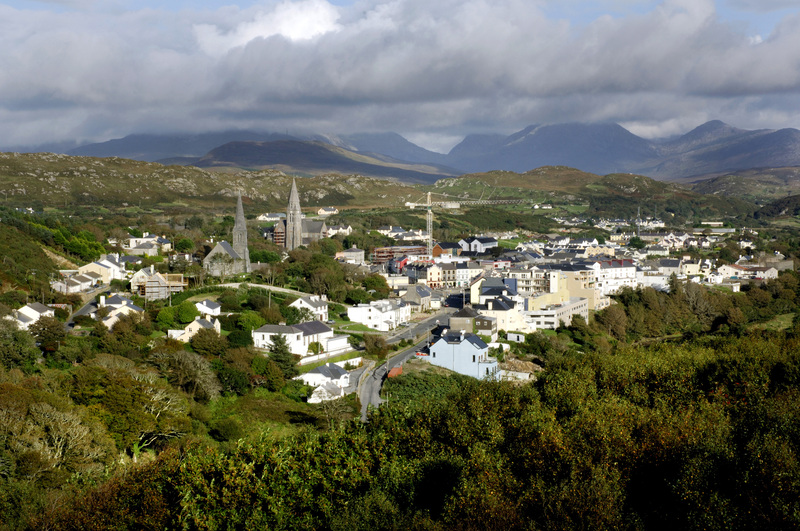 Clifden may be small in stature but it packs a punch with its collection of restaurants and bars. It also has lots of arts and craft shops for you to stop at. 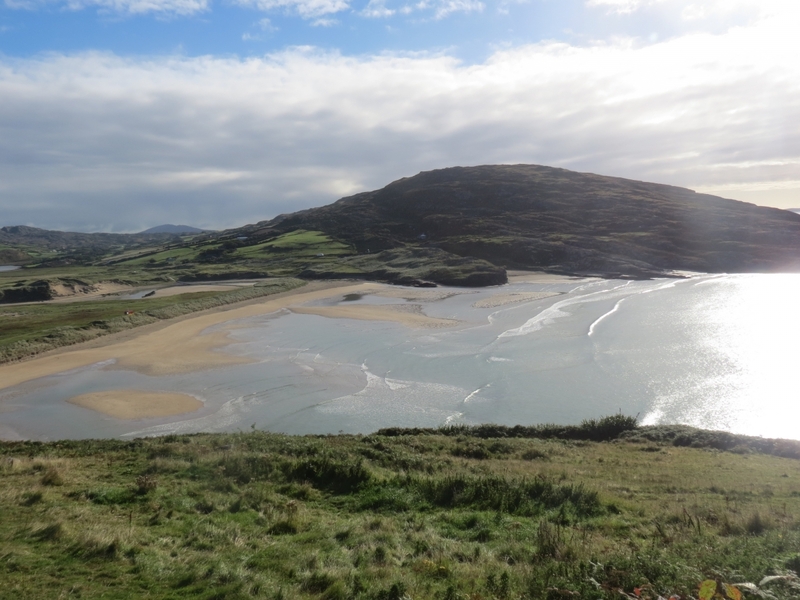 Highly recommended is the “Sky Road” offering unparallel views over Clifden Bay. Kilronan is the main village on Inis Mor on the largest island of the three Aran Islands and is one of the most picturesque spots in Ireland. This was a fishing port for the Aran fisherman and presently the main function of the port is that of a ferry terminal and a place for festivals. As one of the most unique and diverse places to visit in Ireland, this should be on everyone’s itinerary to Ireland and one of the best places to visit. Kilronan has an excellent range of restaurants, serving seafood and traditional Irish bars and music. Birr is most famous for its castle and also it is one of the most scenic places to visit in Ireland with the heritage that it has on offer. The town itself was developed around Birr Castle estate of the Parsons family. Birr is known as one of the best Georgian towns in Ireland with its wide streets and makes for a charming place to visit. 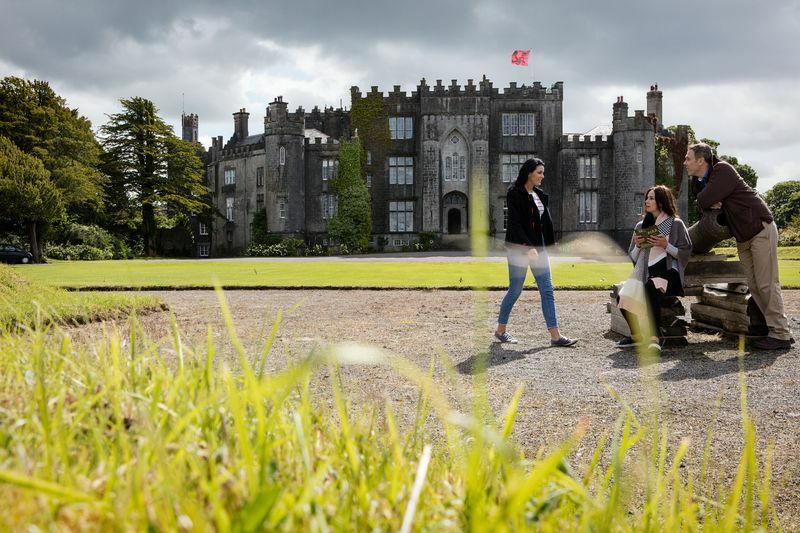 Along with Birr Castle and its grandeur, it is well worth taking a walk around the estate grounds where you can be captivated with the formal gardens and the Great Telescope. The best way to learn about Ireland and its towns and villages is to visit, immerse yourself in the history and heritage of the places. Contact us today for a quotation from our dedicated travel advisors who will be able to help you create your ideal trip to Ireland and answer any questions you may have. We can tailor your itinerary on any of our Self Drive or Chauffeured tours. Mayo is a hidden gem of a county on the Wild Atlantic Way situated on the Western Seaboard of Ireland. It has lots to offer to all visitors with its stunning landscapes and diverse range of scenery it has many points of interests. It is steeped in history and culture. This below is some recommendations of the “Top 10 Things To Do in Mayo” and why it is a place to put on your itinerary to visit this coming 2018 in Ireland. 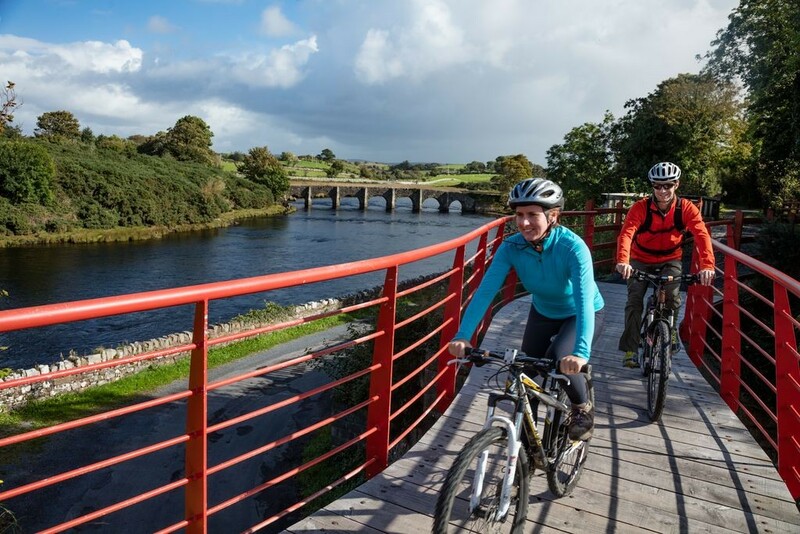 Mayo offers a range of outdoor activities ranging from exploring the Greenways by cycling or walking. Also excellent opportunities for, angling, mountain climbing, and water sports such as surfing or paddle boarding. One of the hidden gems of Mayo is Achill Island with its breath-taking landscapes, its people, and natural fauna – This Island will not disappoint you with lots things to do and explore. 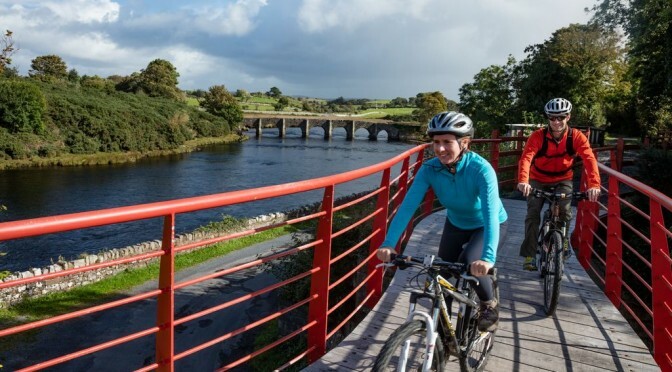 This is the perfect way to explore the area, be it walking or cycling part of the Wild Atlantic Way with 42km of Greenway along the old Westport to Achill railway line. What better way to escape the urban life and travel the longest off-road walking and cycling experience in Ireland. Perfect place to start this trip is from Westport and it takes you to villages of Newport, Mulranny and finishes up in Achill Island. This is a first-rate way to see the natural beauty of Achill Island. It is a special mystical drive that takes in the rugged scenery of the island with beautiful beaches and rugged cliffs with excellent opportunities to stop off and take some panoramic pictures. The island is blessed with many nice traditional pubs, restaurants serving beautiful nutritious traditional Irish food. 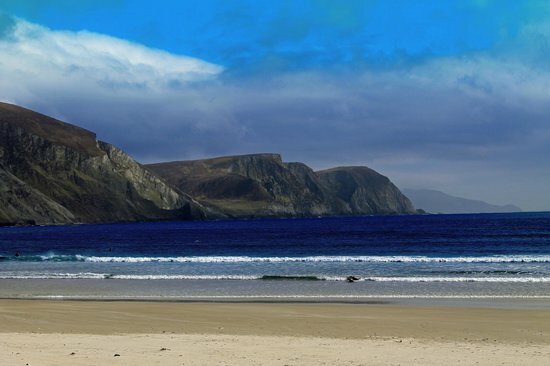 Achill Island is perfect for a day trip or overnight stay. Westport name comes from Cathair na Mart meaning “stone fort of the beeves”. It is situated on the south-east corner of Clew Bay, an inlet of the Atlantic Ocean on the west coast of Ireland. The current town center as it stands today was designed in Georgian architecture style in the 1780s by James Wyatt. The town layout was urban design incorporating medieval principles. 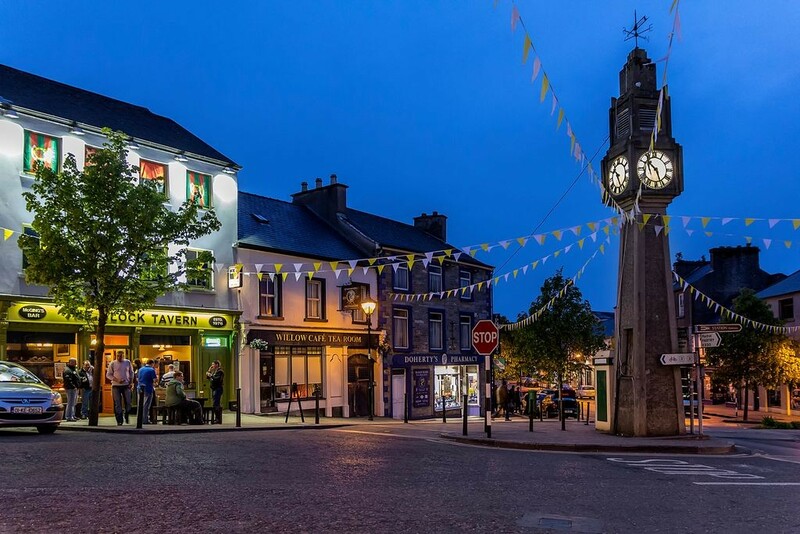 Westport is famous for its collection of traditional Irish bars, selection of quality restaurants, hotels, bed and breakfasts. Combined with a vibrant friendly local population it makes for the perfect place to stay. 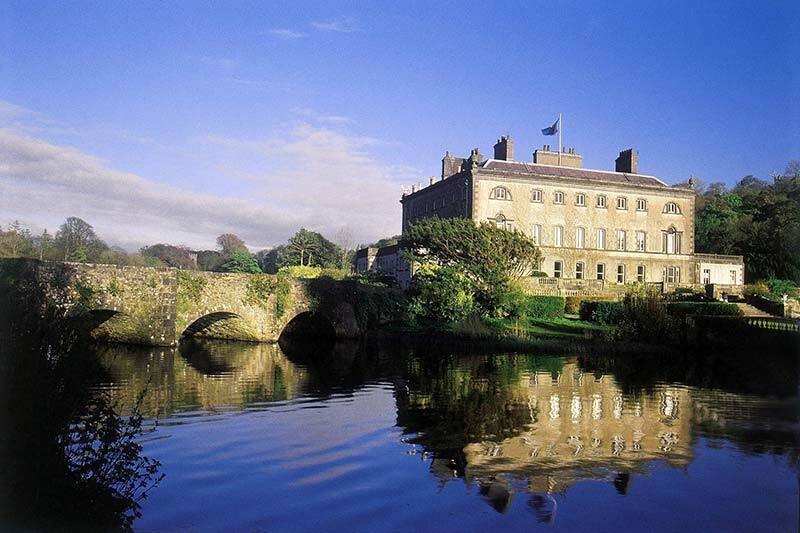 Westport House is one of Ireland’s most loved heritage attractions. It is possible for visitors to view one of the finest places built in the 16th Century in Ireland with 30 rooms available to tour. This house dates back to Grace O Malley the Pirate Queen of Connacht who ruled the land and sea around the estate. The original foundations of Westport House were built in 1650 by Colonel John Browne and his wife Maud Burke, Grace O Malley’s great – great – granddaughter. 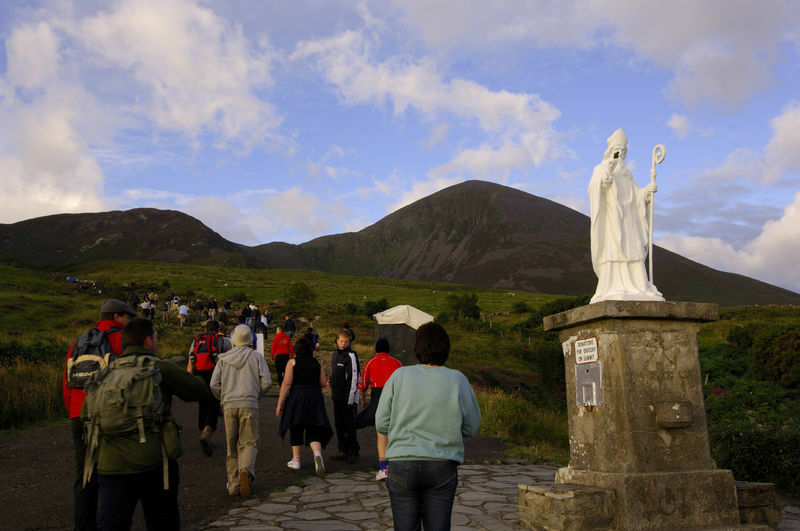 Croagh Patrick is locally known as the “The Reeks” situated 10 km from the town of Westport. If hiking or hill walking is your interest this is a mountain that will not disappoint. 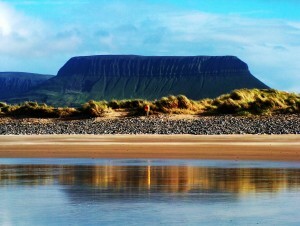 The mountain is regarded as Ireland’s Holy Mountain. The mountain offers spectacular views of Clew Bay, Achill Island, and surrounding areas. It is best advised to climb during the summer months between (April – September). The mountain rises 762m above sea level and generally takes approximately 4-5 hour round trip. 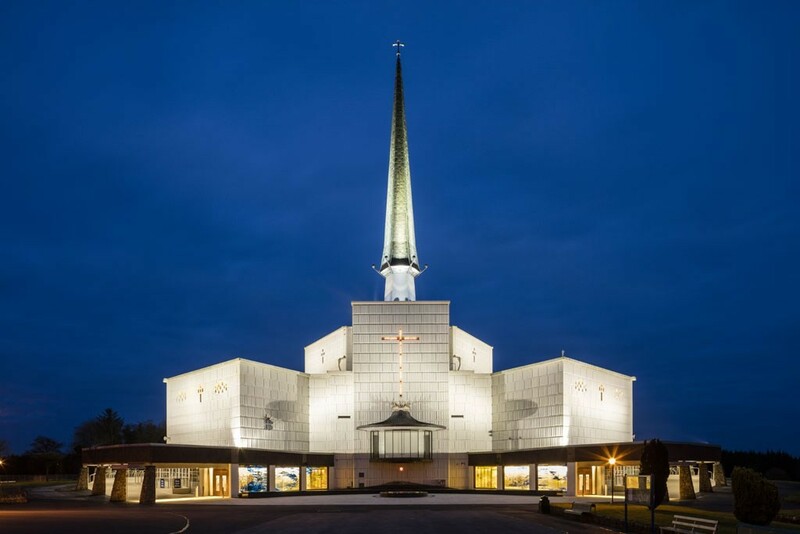 Knock Shrine in Gaelic Cnoc Mhuire “Hill of Mary” is a very important holy place in the village of Knock. It is a Roman Catholic pilgrimage and National Shrine where it has been observed that there was an apparition of Saint Joseph, Blessed Virgin Mary, Saint John the Evangelist and Jesus Christ in 1879. During the time that this happened Ireland had been coming to the end of the great famine and the 1870s saw the beginning of land reform which changed Irish rural life with the events of Knock happening at the beginning of the Land War. 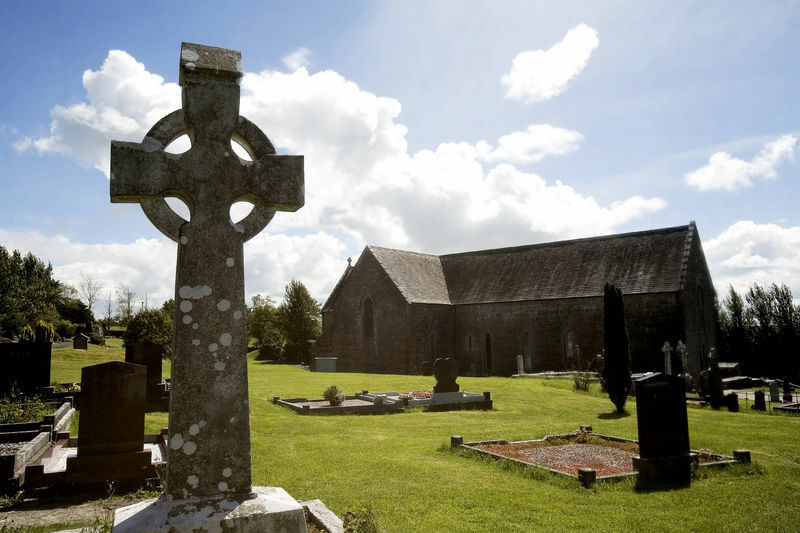 This is one of the earliest church to be founded after Saint Patrick came down from Croagh Patrick established in 1216 and it is only the church in the Irish state founded by an Irish king that is still in use. This abbey has quiet the history, the abbey was burned by the Normans, seized by James I and suppressed by Henry VIII. To add to this historic abbey, the roof was burned by Oliver Cromwell soldiers in 1653 and not fully restored until 1966 but even so, there was no roof, the mass was continued to be said. It is some feat to have the abbey celebrating mass continuously for the past 800 years which is the only church in Ireland to do so. 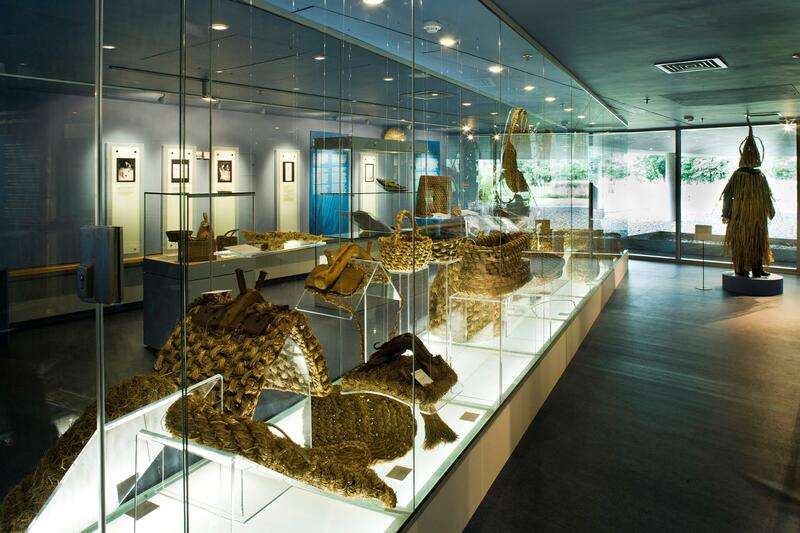 This is an award-winning Museum of Country Life and is home to the National Folklife Collection. This museum is spread out over four floors showcasing rural Ireland in the hundred years between the Great Famine and the end of the 1950s. One learns about traditional clothing of the Aran Islands, folklore objects and a selection of photographs depicting the living environment of the people working on the land and sea. Also, visitors get to learn about the resources people used in that time and the skills that were required to live in rural Ireland. River Moy is one of the most productive river systems in Ireland. It is approximately 100km long which drains the catchment of over two thousand square kilometers. Within this river fishing system is some excellent lough such as Conn and Cullin with also streams and lakes. The Moy river is famous for being one of Ireland’s premier Salmon rivers and the great thing about it is that it offers a great range of quality angling to suit all tastes and budgets. The Moy estuary is also excellent for sea trout that can exceed four pounds and can be caught on fly and bait. The fishing season is from February 1st – September 30th and it is important to check with ghillies and owners to confirm the local rule. If you are interested in sampling Ireland’s world-renowned fishing, the River Moy offers you all this and more. The best way to learn about Mayo in Ireland is to visit yourself. Contact us today for a quotation including some or all of these locations today – We can tailor your itinerary around what we have to offer in Mayo alongside our Wild Atlantic Way Self Drive or Chauffeured tours. We can customise your trip to suits your needs and wants & create your own unique experience in Mayo and the Wild Atlantic Way that will make it your dream holiday to Ireland. Our final blog post in our Aran Islands series explains how to get to the Aran Islands by ferry, flight or as part of a bus or rail tour. You can get to the Aran Islands by passenger ferry from Rossaveel which is about an hour west of Galway City or from Doolin in County Clare. You cannot bring a car across on the ferry. Weather permitting; the ferries from Rossaveel go year round whereas the ferries from Doolin usually go from around March to October. The ferries can be cancelled if the weather is too bad as the crossing would be too dangerous. The ferries from Rossaveel have less cancelled sailings per year than there are from the Doolin port. How long does the ferry to the Aran Islands Take? The ferry crossing to the Aran Islands can get very rough, if you suffer from travel sickness, then you should think about your journey before setting off. Think about visiting the island closest to port (Inishmore from Rossaveel and Inisheer from Doolin) and pick up some motion sickness pills before you go. I find sitting outside, looking out to the horizon helps me! There are a number of companies offering bus transfers with ferry tickets from Galway city. You take the bus as far as Rossaveel and then take the ferry. If you don’t want to drive, this option is included in our Independent Rail Tours. You can fly to the Aran Islands in a small passenger plane from Connemara airport. The flight takes about 10 minutes and there is a maximum of 8 people allowed in the plane, depending on the weight of the passengers, there could be fewer than 8. Connemara Airport is located in Inveran which is about 40 minutes west of Galway City. You do need to book your flight in advance with Aer Arann Islands. 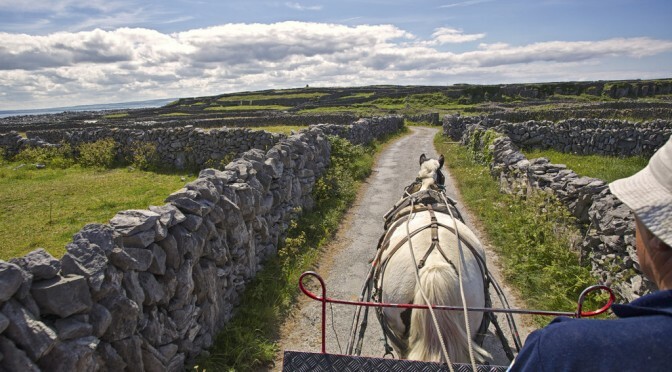 Get in touch with us today and take the hassle out of booking your trip to Ireland and the Aran islands! Inishmore (Irish Spelling Inis Mór) is the biggest and most populated of the famous Aran Islands off the coast of Galway in Ireland. The entire island is about 30km squared. 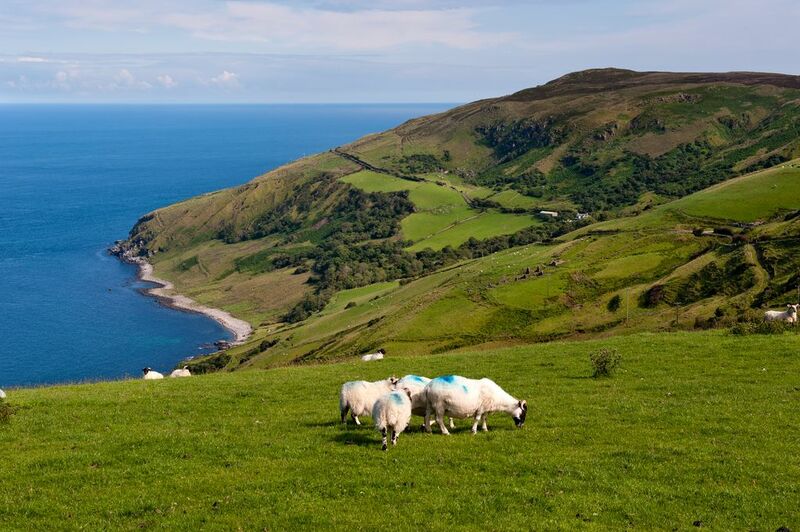 As with all of the islands the spoken language is Irish although locals can usually speak both English and Irish. The locals are dedicated to preserving traditional Irish culture and traditional Irish music is very much alive in Kilronan, the islands main village. When you arrive on the island there are usually mini buses lined up, waiting to take prospective clients on tours around the island which feature all the major sites. There is a small fee for these tours. You can also usually take a tour of the island by horse and trap which is more expensive than the bus tour. There are also several bike hire companies, should you wish to see the island that way! 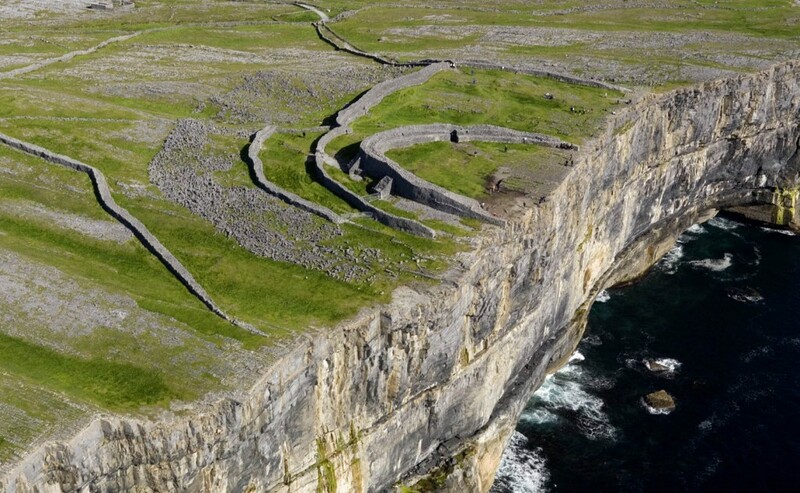 Dún Aonghasa Fort & Visitor Centre: A superb example of an Iron or Bronze Age Promontory Fort, standing dramatically at the edge of a 100 metre high cliff! The on-site visitor centre will tell you more about how and why it was built. The Worm Hole: A natural rectangular shaped pool at the bottom of the cliffs south of Dún Aonghasa. Dun Duchathair (The Black Fort): This fort is situated on the cliffs near Cill Éinne. It is a lot quieter than Dún Aonghasa in terms of visitor numbers. The fort is not easy to access, wear good walking boots and prepare for a bit of a trek if you wish to visit! Kilmurvey Beach: There is a beautiful sandy beach on the island just off the road between Kilronan and Dun Aengus. For more general information on the Aran Islands see our Aran Islands blog post here, or for information on getting to the islands click here. Want to book a tour that includes Inishmore? 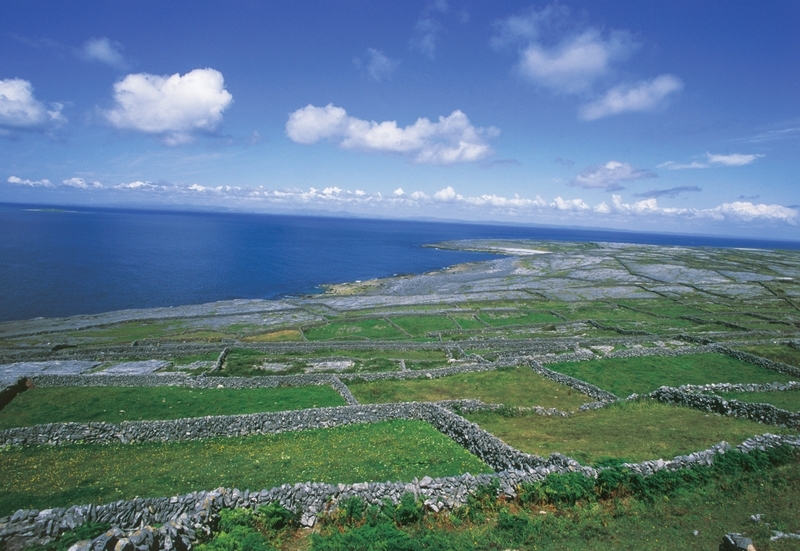 The best way to learn about Inishmore is to spend time there! Contact us today for a quotation including this location in your Ireland tour! Inisheer (Inis Oírr) is the smallest and most easterly of the famous Aran Islands off the coast of Galway in Ireland. The entire island is about 8km squared and has a population of around 300. 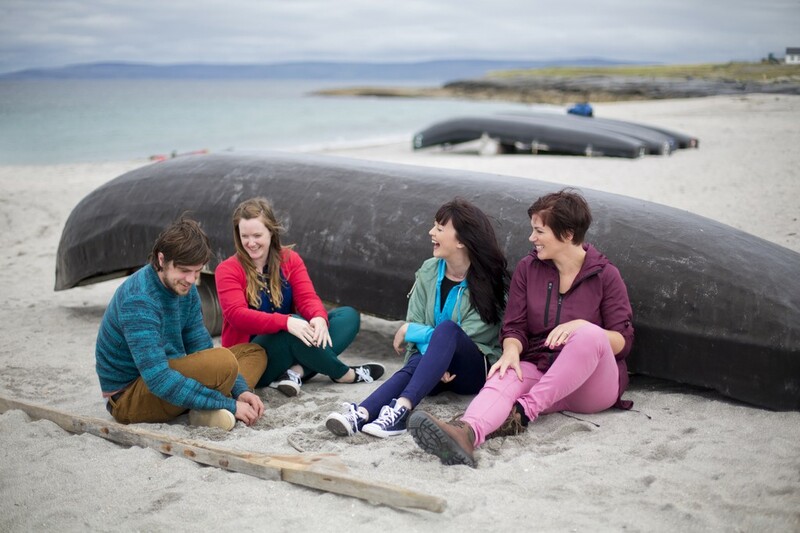 Like the other Aran Islands the spoken language is Irish although locals can typically speak both English and Irish. When you arrive on the island there are usually coaches lined up, waiting to take potential customers on tours around the island which feature the major visitor attractions. There is a small fee for these tours, payable directly to the driver. You can also usually take a tour of the island by horse and trap which is more expensive than the bus tour. You can also hire a bike to get around on the island if you prefer. The main village is called Baile an Lurgáin and you can walk to it from the pier. In the village you will find the local shop, pubs, B&Bs and restaurants. 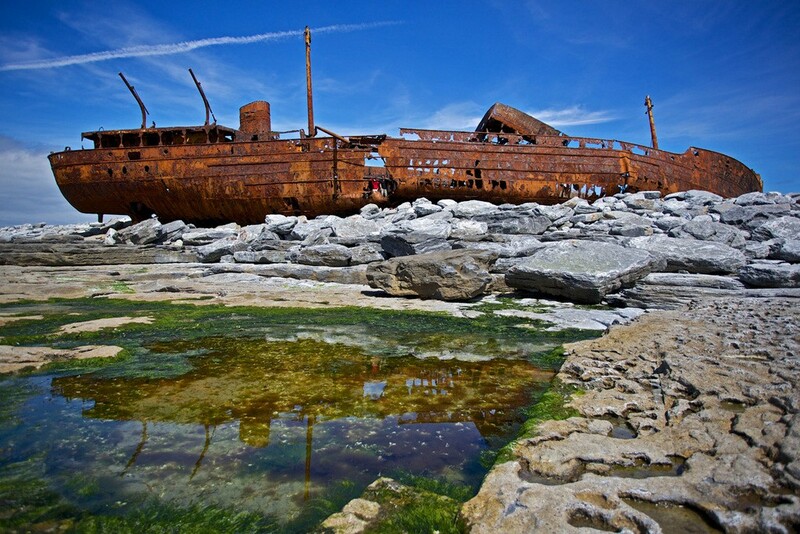 The Wreck of The MV Plassey: The MV Plassey ran into Finnish Rock on Inisheer in 1960 and the entire crew were rescued by a group of local men. The wreck was made famous when it featured in the opening credits of Father Ted. O’Brien’s Castle: This castle ruin is located on one of the highest points of the island overlooking the beach and pier. This castle is thought to have been built in 14th century. An Trá Beach: As you approach Inisheer by boat you can’t miss seeing the white sandy beach known simply as ‘An Trá’ which in English means ‘The Beach’! On a fine day, the water is a beautiful shade of blue. Áras Éanna Arts Centre: Inisheer has a dedicated arts and culture centre which displays traditional Irish and modern arts. The centre has a programme of events and exhibitions from artists resident on the islands which changes frequently. Want to book a tour that includes Inisheer? Inishmaan (Inis Meáin) is the middle island of the famous Aran Islands off the coast of Galway in Ireland. The population of Inishmaan is around 160 which means it is the smallest of the three Aran islands in terms of permanent residents. 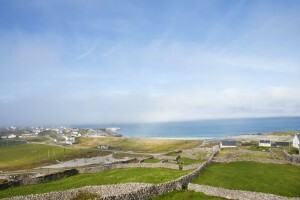 It is also the quietest of the three Aran Islands in terms of visitors and the most traditional of the three islands. The island was loved by author JM Synge who regularly visited. The island is about 9km squared. 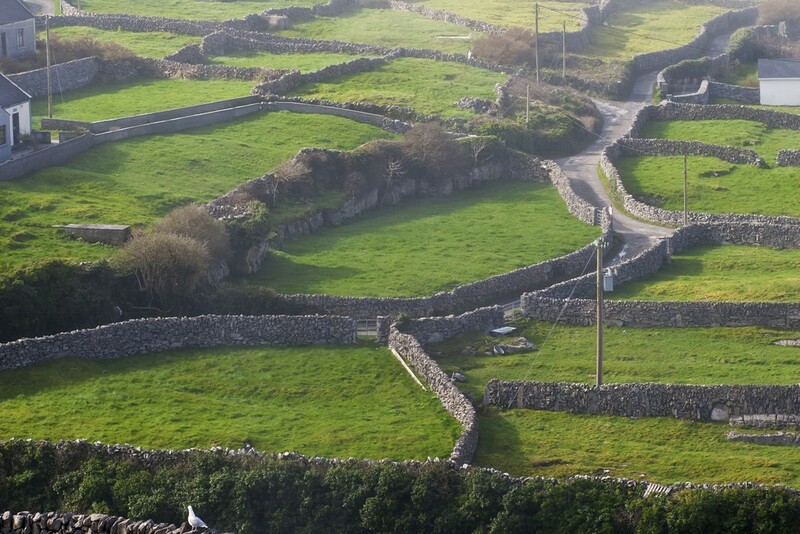 The spoken language in Inishmaan is Irish like the other islands but the residents can usually speak English also. You can get around the island by horse and cart tour, by guided mini bus tour or by walking. Lisheen, the main village is located just seconds walk from the pier and the beach. 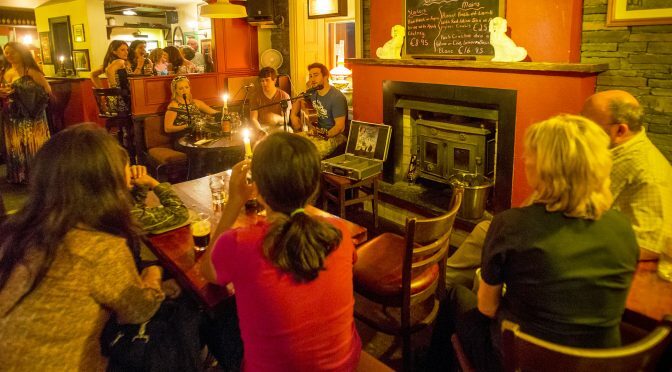 You will find a number of restaurants on the island and there is one pub known for its traditional Irish music sessions, Teach Ósta. Dún Chonchúir: An imposing oval fortress measuring up to 20ft in height. 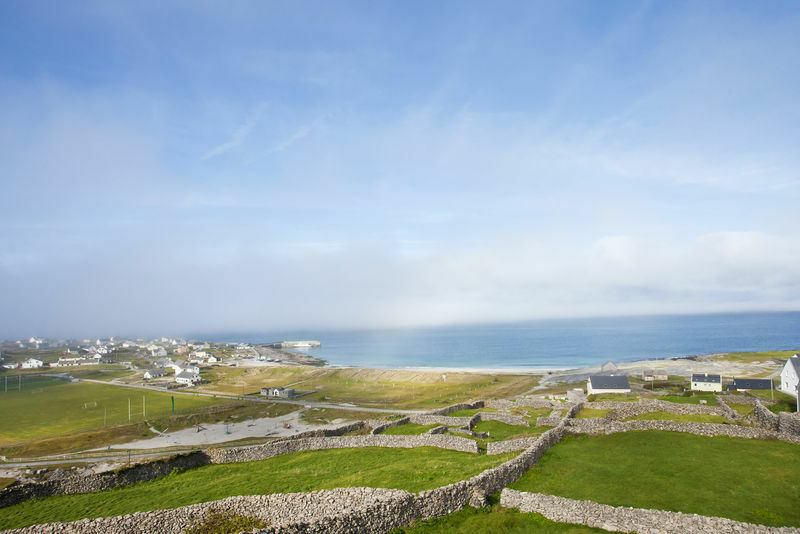 Built on a great height, it has great views of the Island and the other Aran Islands. Dún Fearbhaí : Another stone fort on the island that overlooks the main pier, this fort is most known for its uncommon shape, it is square as opposed to the normal round shape. 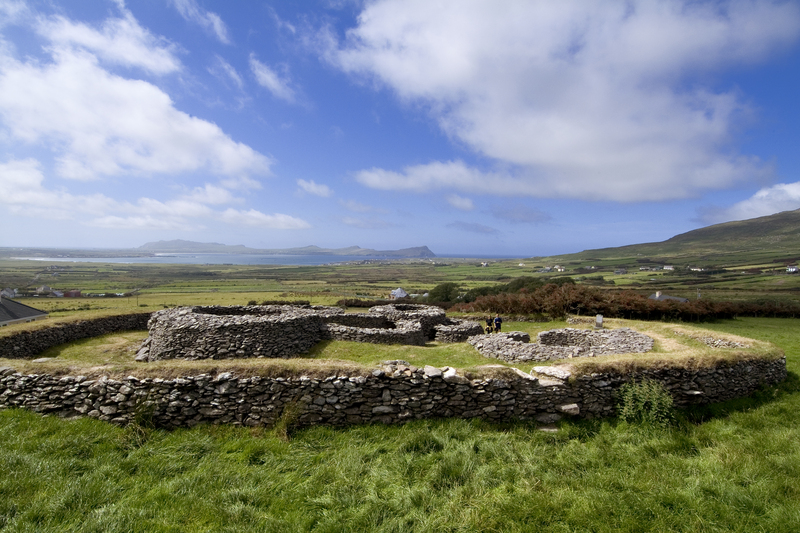 Cill Cheannanach: A well-preserved 8th Century church with excellent views over the Islands. Teach Synge – John Millington Synge’s Cottage & Museum: The summer home of writer John Millington Synge. Synge spent the summers from 1989 to 1902 here working on his upcoming plays. The cottage has been converted to a small museum in his honour. Cathaoir Synge (Synge’s Chair): This was the writer’s favourite place to sit on the island, it has great views overlooking Inishmore Island and the Atlantic. 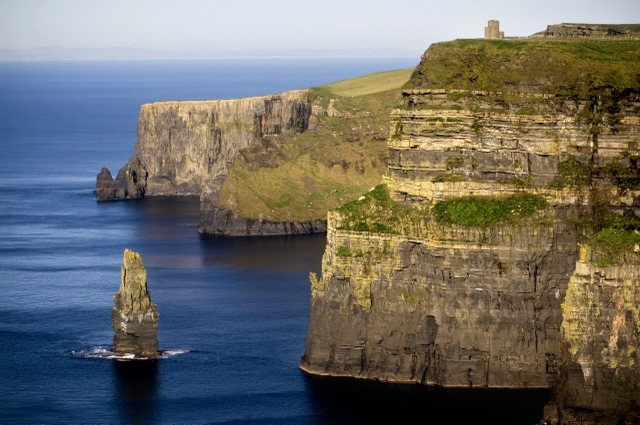 Want to book a tour that includes Inishmaan? In May this year, more than 30 Porsche enthusiasts began the trip of a lifetime! Driving the entire 2,500km Wild Atlantic Way. Beginning at Malin Head in County Donegal, the drivers made their way South, taking in all the stunning scenery the Ireland’s Wild Atlantic Way has to offer. Check out the video here, it may give you some inspiration for your own Wild Atlantic Way Tour!